Marketing Ideas & Sales & Marketing for Professional ServicesWhat Prospects Want When They Google You	Quick Tips Videos & Sales & Marketing for Professional Services & Strategic IssuesWhy did I ignore your networking effort? A survey of over 500 global professional services firms thinking and plans for this year suggested to me that the more things change, the more they stay the same. The standout burning issue for most professional services firms remains attracting and developing new business as that was identified as a key business challenge by 72% of the survey respondents. It could be coincidental, but it is interesting to note that the dominating challenge to get new business in the front door is not matched by the same intensity to manage existing human resources better. Presumably that includes staff or advisers as much as client expectations, but was considered a challenge by only 18% of the firms. Of course, that may be because they are all superb at “motivating and managing people”. But then again I suspect that many are not “superb”, so it might be that shifting some focus to developing more effective staff and managing client expectations better could mitigate the burning need for more new business. “we’re going to get more referrals, become better known, get a cooler website, and sell more stuff to our existing clients”. 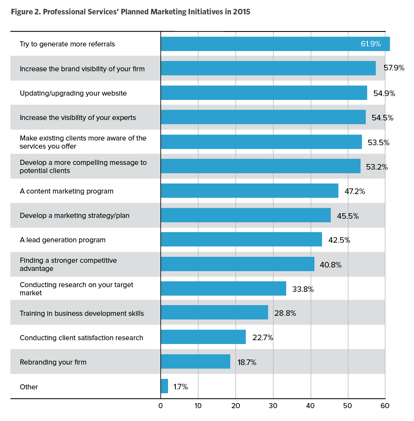 For 2015 that appears to be the big plan for the majority of firms surveyed. As far as marketing tactics go, this list is a superb summary of effective actions a professional services firm could initiate to improve business results. How much of your past business has come via existing clients and centres of influence? With over 70% of new business typically coming from existing clients or existing client referrals for most firms, there is a clear commercial benefit in improving client satisfaction and client engagement levels. Add in the proportion that comes through from Centres of Influence and it becomes blindingly apparent that the best ROI is likely to come from making those people raving fans, rather than a cooler looking website. The single biggest opportunity for a typical financial planning firm to change business results is by investing disproportionately into creating advocates within the existing clientele and prospect base I believe. In a professional service business, do not lose sight of the commercial importance of the “service” part. 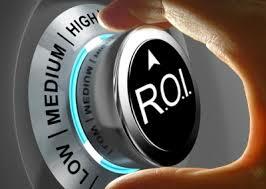 The odds are good that it is likely to be the thing that can change business results quickly. The “service” bit in your financial services business might just be the thing that gives you the best return on investment.